We've all seen this meme, right? Taken at a Nazi Rally on June 13th, 1936. It is normally posted accompanied with the phrase "Be this guy" or similair. We often wondered who he was, and whether he was punished for his action. We always thought he was anonymous. 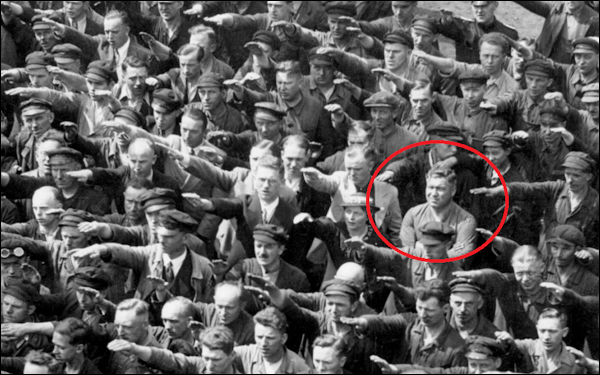 In a post today in the Independent, we've discovered that he was August Landmesser, and he was, at one time, a loyal Nazi. But in 1933, Landmesser fell in love with Irma Eckler, a Jewish woman, and proposed marriage to her in 1935. After his engagement to a Jewish woman was discovered, permission to marry was denied, and Landmesser was expelled from the Nazi Party. They had a daughter in October 1935. And then on June 13, 1936, Landmesser gave a crossed-arm stance during Hitler's christening of a new German navy vessel. The act of defiance stands out amid the throng of Nazi salutes, Several others have also refrained from saluting, but are not so obviously defiant. August and Irma attempted to flee Germany but were arrested at the Danish border. Refusing to abandon his wife, Landmesser ignored Nazi wishes and was arrested again in 1938 and sentenced to nearly three years in a concentration camp. Irma gave birth to Irene in prison and was sent to an all-women's concentration camp. In 1942, she was murdered with 14,000 others. After his prison sentence, Landmesser worked a few jobs before he was drafted into war in 1944. 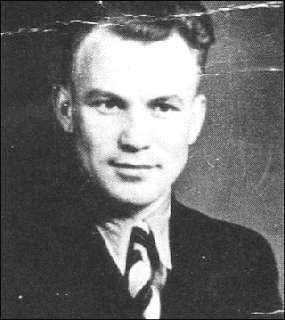 A few months later, he was declared missing in action in Croatia. Love is such a powerful emotion. It sometimes forces you to make such sacrifices, against everything you previously believed. We can't find any photo of Irma Eckler, but she must have been an amazing woman. We should all be this guy.